The Pursuit of Technology Integration Happiness: Think Twice Thursday #6 - How do you Reflect? Think Twice Thursday #6 - How do you Reflect? In a continuation of my Tuesday Post about my experiences with #edchat, I thought a lot about what people said, and also what I said myself. In my new position, I don't get to necessarily teach students anymore. The previous years as a teacher I would often reflect on my day when I went home and talked to my wife who is also a teacher. I realize now that I never wrote any of those reflections down. I can't go back and grow from those discussions with my wife, because I can't remember them to this day. 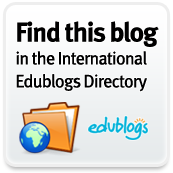 One of the suggestions that I made was that teachers should blog as a method of reflection. It would be an easy way for administrators to open up a dialogue with their teachers about what is going on in their classroom. It is difficult for administrators to get to a teachers classroom more than maybe once a month. So, for any administrators reading this blog, I suggest that you THINK TWICE about asking/suggesting/requiring your teachers to create a reflection blog. They could even attach documents and lesson information which could alleviate the portfolios or assessment notebooks they are already doing. This would be a good way for you to assess the effectiveness of teachers in your building, because they are assessing their own effectiveness. I always thought about writing a book about all the funny things that students say and do when I retire. A blog would have been a good way for me to remember those. Teachers could use a blog to write about classroom experiences, student humor, lesson successes and failures, and ask questions that readers of the blog could answer. Readers could offer support and suggestions about an issue that the teacher might be struggling with that they discuss on their blog. Self-assessment is probably the best kind of assessment that one could do. A blog would be an excellent way to reflect. So to teachers that read my blog, I suggest that you THINK TWICE about how you reflect, and start reflecting by creating a blog. Within this blog assess the effectiveness of your teaching, lessons, assessment, activities, and relationship with your students. This blog has been a great way for me to organize and share much of the ideas, thoughts, and resources that I find useful and that I have shared with the teachers in my building. With my new job there are plenty of instances that offer chances for reflection. Tuesday's #edchat got me thinking about reflecting about my own experiences. So it is a double standard for me to sit here and suggest to my readers that you all should blog, if I myself do not do it. 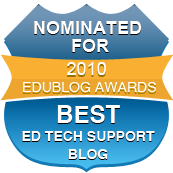 So I am going to THINK TWICE about how I reflect and assess my effectiveness by creating a reflection blog about my experiences as a Technology Integration Specialist. If you maintain a blog and are out of the classroom, you too should THINK TWICE about keeping a reflection blog to assess your effectiveness. I will be starting one shortly and will share once I get it off the ground. I am thinking of titling it "Reflection = Happiness???" Another point/suggestion made during #edchat to get teachers encouraged to blog at my school was for me to offer to watch one of their classes one day for creating and maintaining a blog. While subbing in their classroom I would do a lesson with technology. I think I will look into this. I will let you know how it goes if I decide to tackle such an interesting concept. Must thank ElephantsGerald for the suggestion. Create a blog, and THINK TWICE about assessing your effectiveness. I agree that I should have blogged all those gems over the years. Of course, I spent my time on other things. Thanks for reminding me that, at the end of this career, I may wish to write a best seller. Blogging has been such a big part of my development as a teacher, I highly recommend it as a place of reflection, to keep track of what has been done, and as a place to connect with other educators. I am digging the idea of subbing for a teacher so that they can take the first steps into blogging. One of the biggest complaints that teachers have is a lack of time to try some of these things. When I first started keeping a blog, it was a reflection journal. I was trying out a Problem Based Learning in my classroom last year. I used my blog as a way to reflect and keep track of what did and didn't work for me.